Russian lawyer; born at Luknik, government of Kovno, 1840; died at St. Maurice. Switzerland, July 29, 1891. He was the son of Baruch (Boris) Bank; but, his parents being in poor circumstances, he was brought up by his aunt, Soloveitchik, in company with her son, Emanuel, who later became famous in Odessa. On leaving "ḥeder" he attended the school for noblemen at Poneviezh, and later obtained a gold medal at the gymnasium of Kovno. In 1860 Bank entered the University of St. Petersburg, where, under the tutelage of an uncle, B. Rosen, who had attained the rank of privy councilor in the ministry of marine, he was introduced into influential circles. But the disturbances fomented by the university students, and the consequent closing of the lecture-rooms, compelled him to go to Moscow to continue his studies. In May, 1864, he entered the service of the minister of justice, and, after one year, was honored by an expression of imperial satisfaction for his having unraveled the intricacies in the accounts of the Black Sea division of the fleet, which had been in a confused state for ten years. In 1866 Bank was admitted to practise in the fourth section of the Senate Court of Appeals at St. Petersburg. There he was brought under the supervision of Valerian Polovtzov, who became president of the great railroad association, and of Ratkov-Rozhnov, afterward mayor of the city. For his début Bank committed to memory a mass of material for a report in a very complicated case, and astonished his hearers by the accuracy of his memory and the clearness of his presentation of the most involved details. 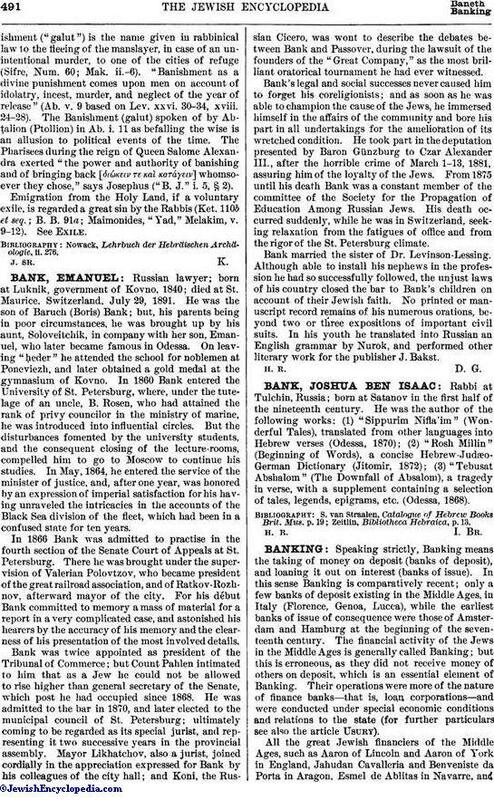 Bank was twice appointed as president of the Tribunal of Commerce; but Count Pahlen intimated to him that as a Jew he could not be allowed to rise higher than general secretary of the Senate, which post he had occupied since 1868. He was admitted to the bar in 1870, and later elected to the municipal council of St. Petersburg; ultimately coming to be regarded as its special jurist, and representing it two successive years in the provincial assembly. Mayor Likhatchov, also a jurist, joined cordially in the appreciation expressed for Bank by his colleagues of the city hall; and Koni, the Russian Cicero, was wont to describe the debates between Bank and Passover, during the lawsuit of the founders of the "Great Company," as the most brilliant oratorical tournament he had ever witnessed. Bank's legal and social successes never caused him to forget his coreligionists; and as soon as he was able to champion the cause of the Jews, he immersed himself in the affairs of the community and bore his part in all undertakings for the amelioration of its wretched condition. He took part in the deputation presented by Baron Günzburg to Czar Alexander III., after the horrible crime of March 1-13, 1881, assuring him of the loyalty of the Jews. From 1875 until his death Bank was a constant member of the committee of the Society for the Propagation of Education Among Russian Jews. His death occurred suddenly, while he was in Switzerland, seeking relaxation from the fatigues of office and from the rigor of the St. Petersburg climate. Bank married the sister of Dr. Levinson-Lessing. Although able to install his nephews in the profession he had so successfully followed, the unjust laws of his country closed the bar to Bank's children on account of their Jewish faith. No printed or manuscript record remains of his numerous orations, beyond two or three expositions of important civil suits. In his youth he translated into Russian an English grammar by Nurok, and performed other literary work for the publisher J. Bakst.